The rapid characterization of ground motion during the initial stage of an earthquake is one of the most effective approaches for quantifying the hazard associated with its impact on populated or otherwise sensitive areas. Earthquake early warning (EEW) systems are based on this approach, and aim to mitigate earthquake hazard for a target area by the provision of timely warnings. In addition, during and soon after the occurrence of earthquakes, the necessity for information on the state of health of structures in real-time that permit timely warnings in case of damaging events requires structural health monitoring systems. The Self-Organising Seismic Early Warning Information Network (SOSEWIN) is a new concept in EEW and structural health monitoring (SHM) systems. SOSEWIN employs advances in various technologies to incorporate off-the-shelf sensor, processing and communications components into low-cost sensing units that are linked by advanced, robust and rapid communications routing and network organisational protocols that are appropriate for wireless mesh networks. Significant and innovative aspects of SOSEWIN are that each sensing unit performs on-site, independent analysis of the ground motion, and that the early warning is transmitted throughout the network by means of dedicated alarming processes. In this work, a description of the SOSEWIN philosophy, hardware, and software is provided, as well as an overview of its application within different contexts. In particular, we present the results of tests carried out with SOSEWIN in Istanbul, Turkey, where a first test-bed consisting of 20 instruments is installed, as well as a novel approach for EEW that exploits the SOSEWIN philosophy to obtain, in the event of an earthquake, a real-time structural response assessment following an interferometric approach (Fleming et al. 2009). Finally, the application of SOSEWIN for SHM purposes at a building in L’Aquila (Picozzi et al. 2009a), a suspension bridge in Istanbul (Picozzi et al. 2009b), and a historical arch bridge in Luxembourg City (Oth and Picozzi 2012) are presented. 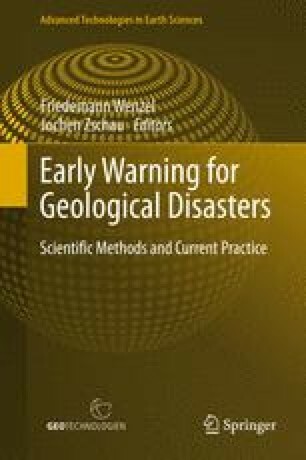 The work undertaken in the paper was supported by the Seismic eArly warning For EuRope (SAFER, European Commission proposal no. 036935), Earthquake Data Information system for the Marmara Sea (EDIM, Turkey, German Federal Ministry of Education and Research), PROGRESS (Georisiken im Globalen Wandel) projects, and the German Earthquake Task Force. The establishment of the network in Istanbul was carried out in partnership with Kandilli Observatory and Earthquake Research Institute. The SAFER and EDIM working groups developing SOSEWIN were: J. Zschau, C. Milkereit, M. Picozzi, K. Fleming, I. Veit, K.-H. Jäckel, J. Nachtigall, and H. Woith (Helmholtz-Zentrum Potsdam Deutsches GeoForschungsZentrum, Germany); J. Fischer, J. P. Redlich, B. Lichtblau, F. Kühnlenz, K. Ahrens, I. Eveslage, and S. Heglmeier (Department of Informatics, Humboldt University (HU) Berlin, Germany). Mike Hönig (Helmholtz-Zentrum Potsdam Deutsches GeoForschungsZentrum, Germany) developed the Analogue-Digital Converters (ADC) board together with one of the authors (K.-H. Jäckel). We thank M. Erdik, C. Sulfikar, E. Safak\(\cdot \)O. Özel and the Bakirköy AKOM staff for their assistance in arranging for and installing the SOSEWIN in Istanbul. We are grateful to M.Mucciarelli, D. Di Giacomo, R. Ditommaso, M. Pilz, and R. Bauz, for the fieldwork during the Task Force mission. The authors wish to thank A. Oth, T. Boxberger, H. Jacob, the Division des ouvrages d’art and the Service géologique of the Administration des Ponts et Chaussées, and in particular Patrick Lenners and Robert Colbach, for their kind support during the planning stage and realization of the experiment on the Adolphe bridge. The authors wish to thank F. Wenzel and J. Zschau for the invitation to submit our work for this special volume.